I have an interesting relationship with vegetarian food: I have never intentionally eaten vegetarian, but I do fairly frequently eat meals that just happen not to have any meat in them — especially pasta. Yotam Ottolenghi’s Plenty More (Ten Speed Press, 2014, and a James Beard Foundation award nominee) is the sequel to his earlier Plenty , and was presented to me as an Amazon recommendation, and on a whim, I bought it when it came out last year. It perhaps helped that the subtitle of the book is Vibrant Vegetable [not “Vegetarian”] Cooking from London’s Ottolenghi , although I found out later, upon reading, that the recipes were mostly taken from Ottolenghi’s Guardian column, “The New Vegetarian”. When the book arrived, I immediately found a whole bunch of recipes that looked like they were worth trying (see my recipe pointers), and in fact ordered a second copy the next day as a gift for my mother. As it turns out, there are a lot of pasta recipes in this book, and Ottolenghi loves his pasta. So much so, in fact, that his serving sizes are two to three times the “official” FDA reference serving size for pasta, and the calorie counts reflect this. So when I did the nutrition analysis for the first recipe I wanted to try, tagliatelle with walnuts and lemon (p. 75), using his portion sizes it came out to a whopping 901 kcal per serving. To be fair, he notes the controversy over this in the introduction to the recipe, which certainly helps me to calibrate my use of his other recipes. In this case, I chose to divide the whole recipe in three rather than his two — and in retrospect dividing it in four would have been perfectly adequate and would have left room on my plate and in my stomach for an additional vegetable. The recipe is pretty simple, although the prep took a bit longer than I really wanted for a weeknight after work. (I usually get home around 8 PM and would prefer to be done eating and cleaned up by 9 PM so I don’t have to wait too long before starting my exercise!) The ingredients here are the tagliatelle, of course (a whole 300 g dry), a chiffonade of sage, chopped parsley, chopped toasted walnuts, the juice and zest of a lemon, some butter, three tablespoons of cream, and 50 grams of shaved Parmigiano-Reggiano (which I made with a vegetable peeler) — not to mention salt, pepper, and eventually a quarter-cup of the pasta cooking water. I saved some time by prepping the walnuts the night before, but measuring out, washing, drying, and chopping the herbs was actually what took the most time, and that really can’t be done much in advance. 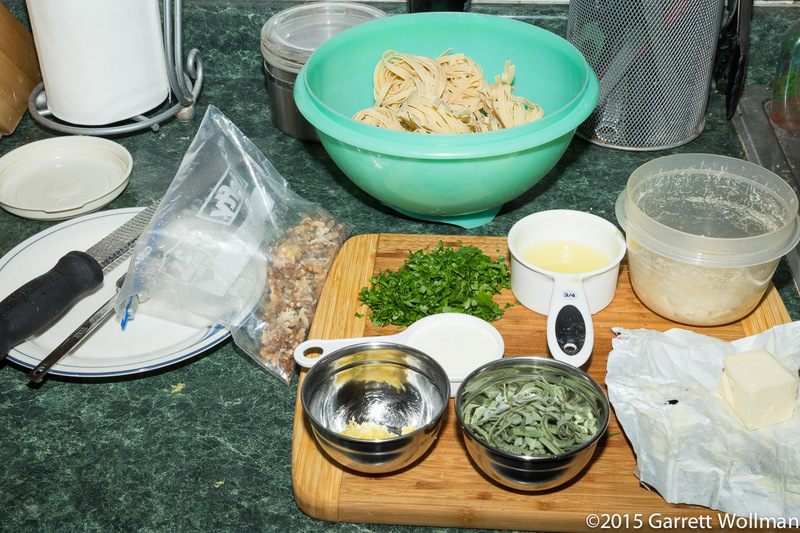 The recipe starts not with cooking the pasta (although I would have saved some time if I had — the timing works out just fine), but rather, making a sage-brown butter cream sauce. This is as simple as can be: cook the sage in the melted butter while the butter browns, adding lemon zest, cream, salt, and pepper, then let it cook just until thickened, then take it off the heat and let it cool, as I’m doing here. The tagliatelle are cooked in the usual way and drained, reserving some of the starchy cooking water; while draining the pasta, the cream sauce is reheated and loosened up with a bit of the reserved cooking water. 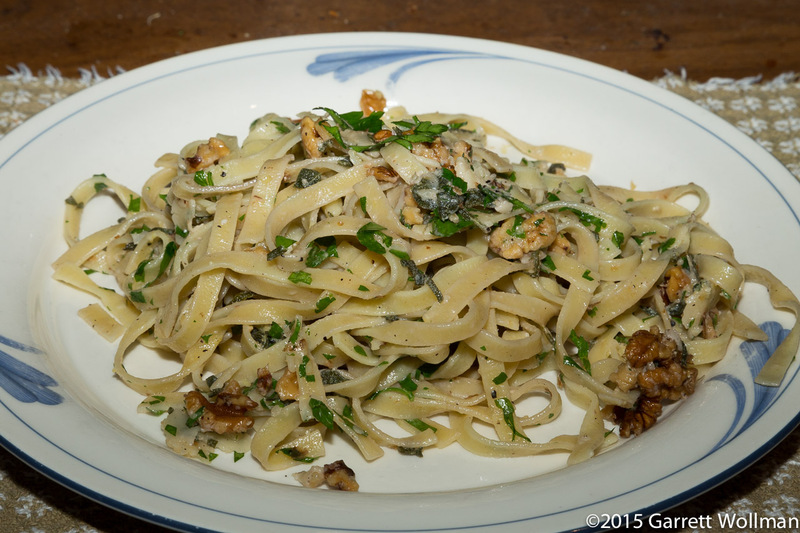 The pasta is then tossed in a bowl with the sauce, lemon juice, chopped parsley, Parmigiano, and chopped walnuts, then immediately portioned for service. You can see that even with 100 g (dry weight) of pasta, it’s still quite a lot. Despite my complaints about the time and the excessive serving size, this is a really easy to make and very satisfying dish, and I would definitely do it again. It didn’t reheat quite as well in the microwave as I might have liked (still tasty, though), and it may be worth figuring out how to make the pasta and sauce separately reheatable without having to redo all the herb prep each time. I also felt like it was a bit difficult to ensure that each portion had an equal share of the toasted walnuts, which are key to the overall flavor of this dish. (When I first took them out of the oven, after a longer-than-normal toasting time of 15 minutes, I thought they tasted burnt, but in the final dish, they mellowed out quite nicely and complimented the rich cream sauce and sharp lemon juice.) These are not problems you’d have making this dish for restaurant service, where the same meal might be prepared a dozen times a day from a stock of sage sauce and freshly-cooked pasta — the other ingredients would be readily available fresh in any restaurant kitchen anyway. 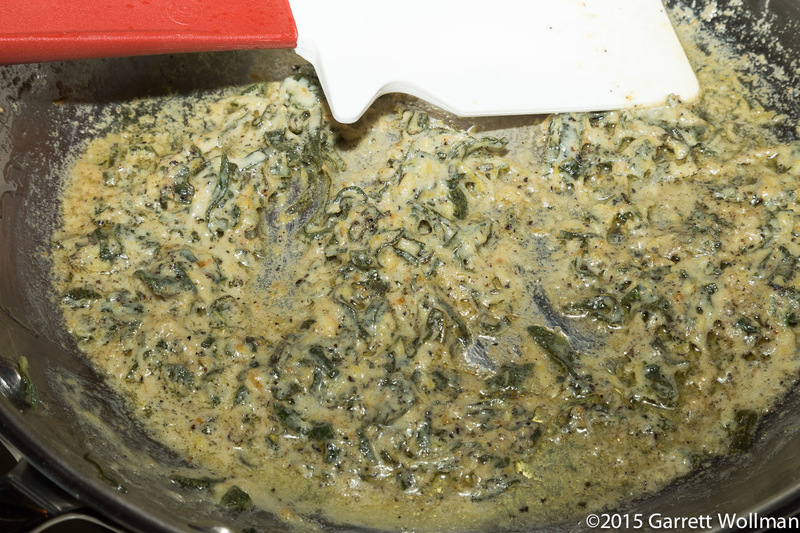 This shows how I portioned it, making three rather than two portions — and next time I’ll divide in fourths. This entry was posted in Food and tagged pasta, recipe, Yotam Ottolenghi. Bookmark the permalink.